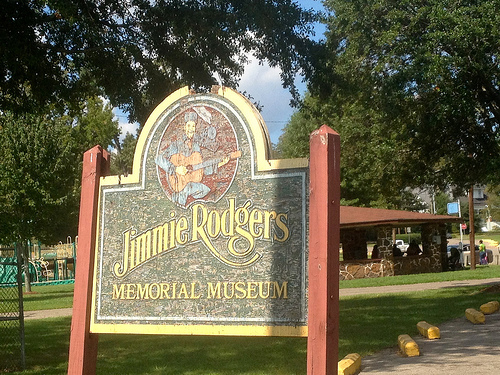 Cooped up in Meridian, Mississippi is one of Country music's most irreplaceable historic landmarks -- the Jimmie Rodgers Museum. Located in his hometown, it preserves things near and dear to Jimmie like his faithful traveling suitcase, letters to his family, and just so happens to host one of the world's most valuable guitars-- his original Martin valued over $1 million dollars. 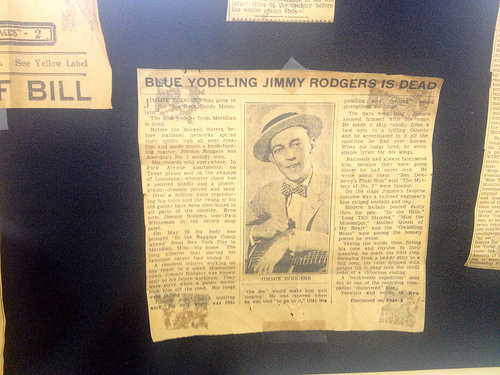 Jimmie's name is inscribed on the neck with mother of pearl and on the back and the famous "THANKS" he flashed to his audience after a performance. Thanks to the devoted care of Betty Lou and the owners of the museum, the story of the world’s beloved singing brakeman lives on right where it belongs, a small town nustled near the train tracks.